Chinatown in GTA IV, as viewed to the west from the Albany Ave-Diamond St intersection. Chinatown is a neighborhood in southern Algonquin, Liberty City, in Grand Theft Auto IV and Grand Theft Auto: Chinatown Wars. It is bordered to the north by Emerald Street (Lower Easton), to the west by Columbus Avenue (City Hall), to the south by Calcium Street (The Exchange), and to the east halfway between Borlock Road and Albany Avenue (Fishmarket South). Chinatown is a residential and commercial neighborhood, Chinese descents and immigrants Tongs as residents, business owners and activity. It's a working class ethnic enclave, serving as a stark contrast to the busy nature of surrounding City Hall and The Exchange. The district features a significant number of narrow streets, and a mixture of small tenement buildings and large low-rise office buildings and shops, some decorated with Oriental or modernist designs. The district is also uniquely adorned with large, overhanging signs reminiscent of those seen in the streets of Hong Kong, despite this practice not being commonly seen in New York City's Chinatown (which signs do not usually extend too far past the edge of sidewalks). The businesses in the neighborhood are Chinese-owned and are tailored specifically for Chinese only. The district is the main territory of the Algonquin Triads in both GTA IV and GTA Chinatown Wars. The Liberty City Subway system serves Chinatown. The Emerald station, located on Emerald Street between Luddite Row and Albany Avenue along the neighborhood's border with Lower Easton, is served at all times by the Algonquin Outer Line. Most of the people are Chinese in ethncity. The spoken lagnuages are Cantonese Chinese and English as it appears in the game. Other things in this topic are unknown. When originally featured in GTA IV, Chinatown boasts only one useful facility, an underground weapons shop is located across the street from the intersection of Cavity Lane and Bismarck Avenue. 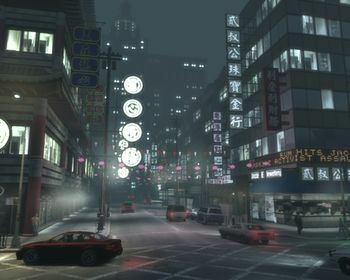 Other landmarks in the district were also featuring over the course of GTA IV's storyline, particularly during "Three Leaf Clover", when Niko Bellic assists Patrick McReary and his peers in robbing the main Bank of Liberty branch in The Exchange/Chinatown and escaping along the narrow alleyways of the district to escape into Emerald station. The "Dragon Heart Plaza" is a mixed-use office building and shopping center in Chinatown which interior was added for both The Lost and Damned and The Ballad of Gay Tony. In The Lost and Damned, Johnny Klebitz and Jim Fitzgerald attempted to sell the heroin that they stole during "Action/Reaction" back to the Algonquin Triads; the Triads shoot at Johnny and Jim, as they fight their way out of the roof of the Dragon Heart Plaza. In The Ballad of Gay Tony, Luis Fernando Lopez and Anthony Prince must fight their way down from the upper floor of the building's interior against an army of Algonquin Triad members in "Chinese Takeout". An Al Dente's restaurant may also be found at Albany Avenue and Calcium Street. When requested for Stevie's Car Thefts, a Super GT can be found parked across the street from the 69 Exchange. Algonquin's Chinatown is directly inspired by New York City's own Chinatown in Manhattan. Many buildings in GTA IV's Chinatown are apparently based on those situated within Manhattan's Chinatown as well as adjacent Lower East Side districts. 51 Bowery at Canal Street (HSBC Bank and former Citizen's Savings Bank). Depicted in game as a Bank of Liberty branch at the southwestern corner of Chinatown at Columbus Avenue and Calcium Street, and prominently featured during "Three Leaf Clover". The Manhattan Bridge approach arch in Lower Manhattan. Although the Algonquin Bridge (which is based on the Manhattan Bridge) exists, the game's rendition of the approach arch is placed in front of Broker Bridge, a representation of the Brooklyn Bridge, and features two arches instead of one in the real life rendition. 241 Canal Street (former Golden Pacific National Bank), depicted in game as the Dragon Heart Plaza. Located in game at Diamond Street and Albany Avenue, the interior of the Dragon Heart Plaza is prominently featured in The Ballad of Gay Tony, during "Chinese Takeout". 277-289 Canal Street (The Oltarsh Building; former Major Theater); its in game replica is located at Columbus Avenue and Emerald Street. The game's rendition was modified to feature the fascia of 277 Canal Street on all four corners of the building. The building also houses the Videogeddon video game arcade, which is a destination in "Ruff Rider". 185 Canal Street (pre-2008/2009 renovation) (United Orient Bank); its replica in game is located at Albany Avenue and Diamond Street. While making use of the building's facade and lobby entrance design, the building is significantly smaller. And unlike 185 Canal, the GTA IV rendition also features a stock and news ticker. Map provided with the game depicting the Chinatown area and its surroundings. Cavity Lane, a typical narrow street found in Chinatown, GTA IV. Chinatown branch of the Bank of Liberty, GTA IV. Approach arches at the Algonquin end of Broker Bridge, GTA IV. The building housing Videogeddon, GTA IV. This page was last modified on 30 August 2012, at 21:16.